Lowdown: The Ricoh Women’s British Open will be played over the Old Course at Sunningdale for the fourth time. Designed by Willie Park and opened for play in 1901, the Old is one of the UK’s most loved inland tracks and the top women always enjoy visiting the famous Berkshire club. The tournament last came to Sunningdale in 2004 when England’s Karen Stupples put on a fantastic display to win. She started her final round in spectacular style with an eagle three at the first then an albatross two at the second, she finished the week at -19. Mexico’s Lorena Ochoa will be at Sunningdale to defend the title she won in some style at St Andrews last year. The 26-year-old has six victories so far in 2008 but hasn’t won a tournament since May, she’ll be keen to rectify that this week. Laura Davies will be competing in her 60th consecutive major championship, the 44-year-old has won four major titles and needs one more to secure a spot in the LPGA Tour and World Golf Halls of Fame. Lorena Ochoa – The defending champion will be the favourite again this time round. Annika Sorenstam – She’s announced her retirement at the end of the season but would love to scoop another British Open before leaving the pro circuit. Inbee Park – The young Korean was a surprise winner of the US Women’s Open. She’ll be out to prove her success was not just a flash in the pan. Key hole: 1st and 2nd – The course opens with two par fives measuring just 485 and 489 yards and it’s crucial to get off to a good start. Karen Stupples displayed the importance of this in 2004, playing those first two in -5 in the last round. 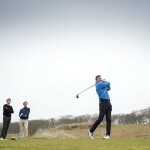 Skills required: Accuracy – The Old isn’t an overly demanding course if you can keep the ball on the fairways. Stray off line however and heather, birches and pines await.